So, let’s get to the meat of things–or the chocolate of things, as the case may be. I know there are a gazillion recipes out there for brownies. I mean, if you type in “brownies” on Pinterest, your Pinterest will hang for five minutes while it tries to deliver the search results. A good friend of mine and I had a discussion about this treat not too long ago, which ended up being the catalyst for my search. 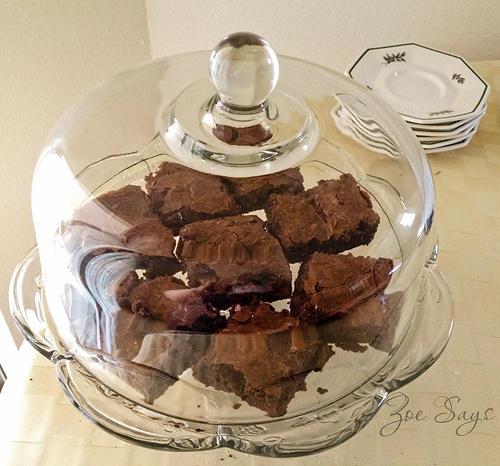 I have yet to find a brownie at any bakery in my town that is what I dub a “Zoe brownie.” Frankly, it’s been a long while since I’ve consumed a brownie in a commercial or retail setting that was memorable. Probably not a shock to those who know me but I am very picky about how brownies should look and taste. My opinion is that they should be rich, not too sweet, very chocolatey, dense, chewy on the edges, and have nothing to distract from these qualities, e.g. nuts, peanut butter, chips, icing, etc. When I conducted my aforementioned Pinterest search, the results returned were all brownie recipes that had a whole bunch of stuff on or in them. So I scrapped that, went back to good old Google, and narrowed my findings down to four solid looking recipes. After reading through them, I was able to narrow down the possible winners to two, both of which claimed to be the BEST brownies. It then came down to ingredients and preparation. Based on that, I decided to go with one posted on Cravings of a Lunatic, entitled, “The Best Brownies in the WORLD!! !” I was ready and willing to prove whether this claim was, in fact, true. There’s only one thing I have to say about that. Using the inflection of Chris Traeger’s character from Parks and Rec, I can say with no exaggeration that they were LIT’RALLY? the best brownies I’ve ever had. I have no idea how the original author came up with this outstanding recipe, but it is nothing short of divine. Remove from heat and add the sugar. Stir well. Bake for 35-45 minutes, toothpick inserted should come out clean (or mostly clean) when done. Remove and cool on a rack. 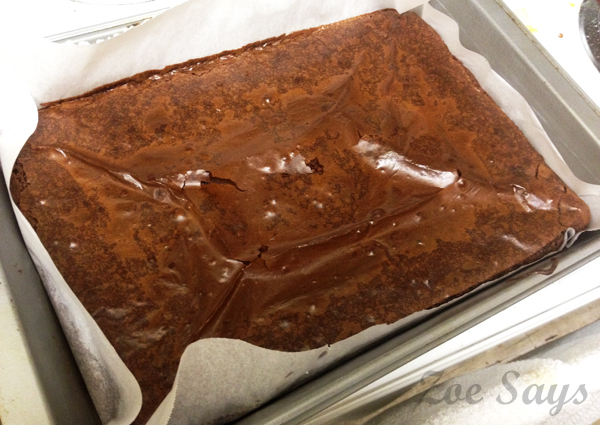 These brownies taste unbelievable after cooling a bit but are still warm, with or without a scoop of ice cream. They definitely require milk or coffee to accompany them. They also keep! Boxed brownies, while they can bake up decently, usually just taste like hardened chemicals the next day, which makes me gag. Not these babies. Granted, they don’t last very long because you can’t believe how good they smell and taste, and so you and your family eat them pretty quickly, but they DO keep. Breakfast, snacks, dessert, just because, whatever. If you’re a gym goer or don’t indulge often, I promise it’s worth the extra gym session or having a cheat. These brownies are super rich and chocolatey, moist, fudgey, smell like a chocolate shop and everything good in the world, and come out of the oven with a delicious glossy crust. The edges are perfectly chewy and add a lovely bit of texture. Make some for your office mates and share if you don’t want to end up eating half a pan of these sinful things. 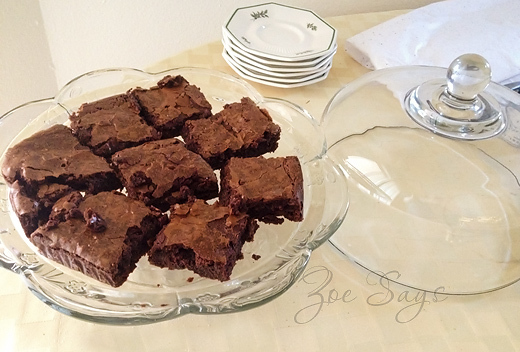 What’s a blog post about brownies without photos? Here are a handful. I honestly didn’t get a lot because we pounced on them like rabid hyenas. It goes without saying but here it is anyway: this is totally a Zoe Recommends! Please let me know if you do and what you think! You keep posting these brownie recipes, I’m going to have to try one. (I’m more confident about my cooking than I am my baking skills – right now, my wife’s great at both). As always, it’s great to read your new posts! 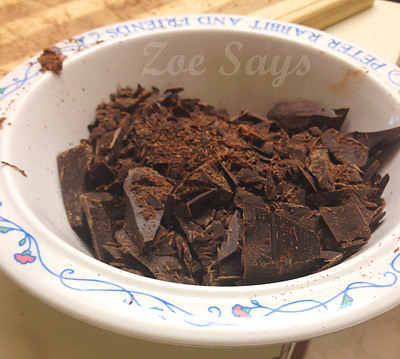 Alan, this one is SOO easy and the payoff is enormous (if you love chocolate, of course)!